Fifth child in a family of Jewish timber traders. She was educated in Warshw and in 1886 she joined the Proletariat Party. She organised strikes and in 1889 she fled to Switzerland to avoid an arrest. In Zürich she studied philosophy, history, mathematics and economics. In 1898 she married Gustav Lübeck. She moved to Berlin, where she became an active member of the SPD. She published analyses in newspapers and she was strongly opposed to German militarism. She was imprisoned several times between 1904 and 1906. In 1907 she met Lenin in London. After the SPD refused a general strike in 1910 she broke with Karl Kautsky. She taught Marxism at the SPD training center in Berlin. Among her students was the future president Friedrich Ebert. In 1912 she represented the SPD at European events during the time that Jean Jaurès represented the French socialists. When the SPD promised the government to refrain from strikes during the war she organised demonstrations against the war in Frankfurt for which she was imprisoned for a year. After her release she collaborated with Karl Liebknecht, Clara Zetkin and Franz Mehring on pamphlets against the war that they signed "Spartacus". Rosa called herself "Junius". In June 1916 she was imprisoned for two and a half years. She was held prisoner in Poznan and Wroclaw, but friends smuggled her writings out of the prison and they were published. She was released on 6 Nov 1918 and immediately founded the newspaper "Die Rote Fahne" ("The Red Flag") with Karl Liebknecht. In December 1918 se was one of the founders of the German Communist Party KPD. Luxemburg and Liebknecht were arrested in Berlin on 15 Jan 1919 by a Freikorps under the command of Waldemar Pabst. They were questioned and subsequently killed. Rosa's body was thrown into the Landwehr Canal and her corpse wasn't found until 1 Jun 1919. In later years Pabst claimed that Ebert had agreed with the murders. 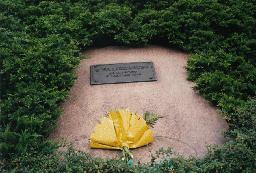 The grave of Rosa Luxemburg at the Städtische Zentralfriedhof Friedrichsfelde, Berlin.